Natural bee sting treatment is the best remedy! Easy herbal remedies and more! Natural bee sting treatment is a perhaps the best way to deal with bee stings. Not only is it usually free or inexpensive, but it also is non-toxic compared to many mainstream bee sting remedies. How amazing that a creature so small can give a sting so big! Most everyone has experienced the intense piercing pain, redness, and swelling so typical of bee stings. What if there was a way to avoid bee stings altogether? Let's take a look. The best bee sting treatment is to avoid the sting in the first place. We're talking about awareness. Anticipating and being aware of your surroundings is really the first way to keep you and the bee as respected friends. Pay attention to them as they buzz around and get to know where they live and what they are up to in their prime season of activity. These hardy little creatures are most active during the summer months when they are busy buzzing around gathering nectar and pollen into their little baskets. The biggest key to prevention is staying calm. I can't tell you how many times I've watched our students avoid bee stings by staying calm, and as well how many times I've watched other students get stung because they freaked out. It is common sense, but as one of our traditional elders, Ingwe, liked to say, "Common sense isn't so bloody common anymore". Symptoms are important indicators of how to respond to an injury and how fast we need to act on them. Here are some of the symptoms to watch for before you rush for that bee sting treatment. 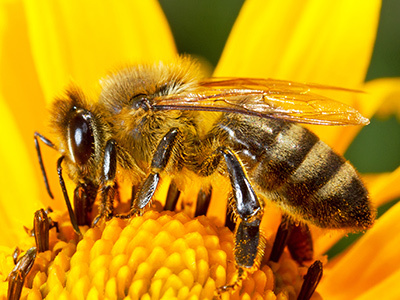 In extreme cases, some individuals who are severely allergic to bee stings can go into anaphylactic shock. In these cases it is possible for the throat and tongue to swell, which can prevent breathing and cause death. That is intense. Many individuals carry epi-pens these days, prescribed to them by doctors. These can literally make the difference between life and death. Remember too that an individual's allergic response to bee stings can change. Just because you weren't allergic last summer doesn't mean that you won't be next summer. Stay aware! First and foremost, if you get a bee sting, the most important thing to do is to stay calm. Getting anxious, fearful, terrified or flustered can actually aggravate the bees and cause them to sting again. 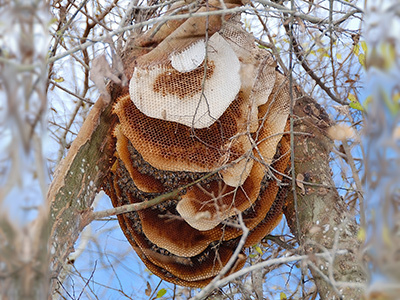 Know that the bees are protecting themselves and following their natural instincts. Getting a bee sting can be very humbling. Staying calm and composed is the first response to a bee sting. In another article I have written on wasp stings I shared that bee stings are different than wasp stings in that a bee stinger is barbed like a miniature hook. Bees also leaves their stinger behind. Wasps and hornets do not leave a stinger behind. It's important to know that if you get a bee sting you should immediately remove the stinger without squeezing it before you seek bee sting treatment. Here are some great bee sting remedies that are incredibly effective for treating stings. This is the number one bee sting remedy. Plantain (Plantago major) is a common plant that grows in most people's yard amongst grass and dandelions. Gather a handful of plantain leaves and chew up or mash and pulverize well. Wrap your plantain pulp in a cloth and apply to your sting area. This poultice will help reduce swelling, itching and ease the pain. This bee sting remedy is particularly convenient because plantain grows so prolifically. Be sure to learn this plant! Combine baking soda with water a little bit at a time until it forms a paste. Add tea tree oil if you have it. Apply a little scoop of the paste to the sting area and leave on for as long as necessary. This provides great relief to bee stings! This bee sting treatment is also very convenient because it is so easy to carry a little container of baking soda in your first aid kit. Combine all ingredients in a large glass jar. When applying, take a small amount and mix with water until it forms a paste. Apply to your sting and let it sit there for a while until it dries, cracks and you feel the urge to wash it off. Wipe clean with a damp wash cloth. This is an excellent healing bee sting remedy. This is both a repellant and treatment, a super practical one to have on hand! Combine the dry herbs and pulverize before putting into a large glass jar. Add in olive oil until it covers the herbs making sure that all the herbs are mixed in well. Let sit in a cool dark place for 3 - 6 weeks and shake the jar periodically. The longer you let it steep the stronger you bug repellant will be. At the end of your steeping, strain herbs from oil and add in ½ tsp. eucalyptus essential oil and 10 drops of spearmint essential oil. This repellant also helps reduce itching and swelling. My experience is that people are searching for a deep sense of joy, fulfillment, peace, and love. It is easy to get distracted from what authentically brings us into connection with these things. By looking deeper into any experience, we have an opportunity to see ourselves for who we are, and a window into living the life we really want. When it comes to bee stings, I always ask, What is this teaching me? Why did this happen? Asking the question is what counts. Then a whole world opens up to us, a deeper realm of experience. Perhaps there is a lesson about slowing down and paying more attention, being more aware. How is that like my life? Do I need to slow down more in general? Am I racing past the precious experience of life, missing the real gems along the way? Or perhaps there is a lesson about respect. Did the bee sting come as a result of an act of disrespect? How is that like my life? Are there people, places, or things in my life that I am not respecting? It is by slowing down and asking these deeper questions that we allow the bigger life lessons to emerge and be received. Interested in being personally mentored on a transformational journey of deep connection to nature, community, and self?